This entry was posted on Tuesday, September 14th, 2010 at 9:25 am and is filed under Computing. You can follow any responses to this entry through the RSS 2.0 feed. You can leave a response, or trackback from your own site. Many thanks for this most useful calendar. 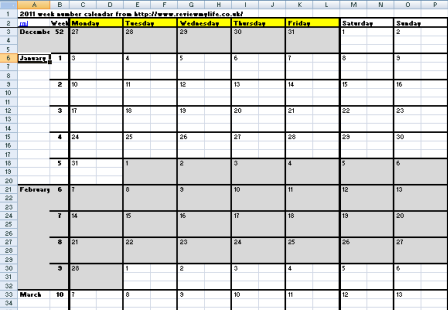 I have a one page vertical 2010 calendar in Word that shows the work week, then the days of the week, then the month. Months are color coded. do you have a way to import it into Excel and then ‘convert’ it into 2011? I still have not gotten around to creating a 2011 version of it.